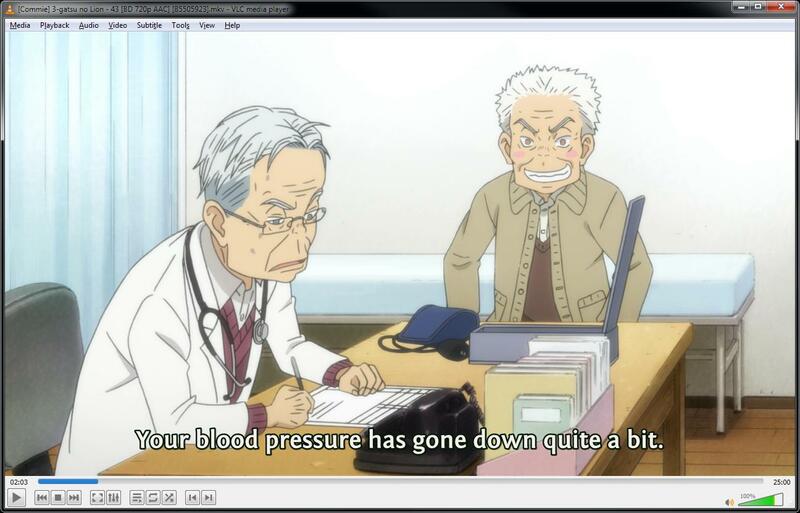 Did you change yout encoding setup from episode 39 to 40? CCCP is a bit out of date, obviously. use this MPC. as for handbrake, i’m glad it breaks. aaah… thank god. When I started ep 40 I thought cccp finally broke =_=;;; ofc its super old but since some of ur newer releases (including Take Your Marks) still worked on cccp, but not those 5 3-gatsu eps, I thought I was totally SOL. For the benefit of other leechers who may be searching the comments for the same problem: The updated MPC herkz linked doesn’t install the way cccp did, more like a portable exe that runs independently of the mpc that came with cccp. So you can have the new MPC on ur pc without uninstalling cccp. The 64bit zip file (v1.8.4) expands to only 50MB so its not a big deal to keep both players just in case. do you really think i uploaded the episodes without watching them myself first? obviously the problem is on your end. Of course I don’t think so and I don’t expect that you watch your encodes with all available video players. But you could think a little bit about backward compatibility. It’s not ideal to change the encoding settings within a show (in fact, the x264 encoder version and at least two parameters in the encoding settings have changed). I didn’t have any issues so far with the old CCCP, so I had no reason to change a running system. Thanks for pointing to the continued mpc-hc project. Handbrake has an update, too (need it to be able to watch subtitled files on my older Samsung TV using DLNA). considering how many of my projects can span months or even years, it’s not really feasible unless i keep around a ton of different versions of x264 for no reason. also, i didn’t change any of the encoding settings. the only thing is x264 and ffmpeg gained support for a feature that was previously unsupported. and i really couldn’t care less about backwards comparability. no setup that can handle what i used before couldn’t handle this now just by updating software. it’s not like you need to spend money or anything. things have supported the new x264 feature for over a year and a half now. there’s no point to keep not using it when it saves filesize. I can’t find subtitles of 3-gatsu no lion S2, can you help me please?! What’s wrong with episodes 40-44? Yes I have MPC but i need it to play on VLC. I can’t even re-encode it or play it on there. can you apply some kind of fix so it’ll work on everything else except just MPC. although i wish it broke in VLC, it seems to play just fine for me in the latest version (3.0.6).